Painting walls a new and exciting color is a quick and affordable way to update a space and give it a fresh look. But how do you find the right tone? When faced with a hundred color samples, it can be pretty daunting. In fact, even the experts sometimes get it wrong. Here are some of the best designer secrets to help you with the process. • Do not pick your color in the paint store. It can be tempting just to pick a color off the shelf and get on with it. I have done it more than I should admit and have ended up with terrible results. Finding the right color is all about context: the shape of the room, the amount and quality of the light, and how it all plays with other objects in the room. Always test a color in the space you are painting. • Do not look at the color sample at an arbitrary angle. This sounds obvious, but sometimes we forget. Color is all about how the light hits it. If you are painting walls, hold the sample vertically; if it is the ceiling, hold it up above your head. This will give you a more accurate indication of what the color will really look like in the end. • Test against a white background. When you hold a color sample directly against a previously painted wall, unless it is white, it will give you a warped idea of the new color. Because colors influence one another, it is best to test the new color against a white background. Simply use a large piece of white paper to blank out the old color. • Do not rely on a small paint sample. A pretty color on a small sample does not necessarily make a pretty color on the expanse of your walls. To get a better sense of what the color will look like on a larger scale, you will need a bigger sample (some stores have larger samples available). A large sample will also reveal the true undertone of the color to test against the undertones of other elements in the room. • Do not paint your sample on the wall. 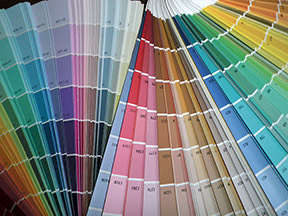 If you cannot get a large color sample, get a sampler of the actual paint and paint it on a poster board—NOT directly onto your wall. This way you will be able to test your colors on different walls and even in different rooms. You will also be able to block out the existing wall color with something white. • Move it around. With your large sample boards, you can put some poster putty on the back and stick them on your walls to get an idea of how colors will look. Test them in different spots on the wall and move them around the room to see how the light affects the color. Also look at them at different times of the day. • Find the bossy fixture. If you are working with existing finishes, find the one that is the most prominent in the room; it might be the carpet, the countertop or even a large piece of furniture. The undertone of that fixture will influence what colors work best for the room. This may sound like a lot of trouble just to get the color right, but it is a whole lot less than the trouble you will be in when you realize that the color is wrong after it has been painted on the walls. Here’s to your brand-new walls! Master Builders Association of King and Snohomish Counties member Mia Hannon is a pro at finding spatial solutions and has an excellent eye for color and lighting. Find more of her work at in-form-design.com.